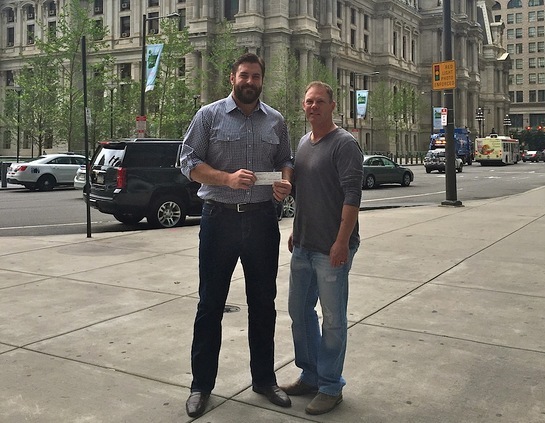 Former Philadelphia Eagles Offensive Lineman Todd Herremans made a surprise visit to Philadelphia charities to donate funds raised from the third annual Hoops for Help event that was held last March. Todd and wife Elizabeth presented checks to the representatives of: Adopt a Pig, Fraternal Order Survivors Fund, Magee Rehabilitation Hospital and The Widows Fund of the Local 22 Charitable Trust. Todd can also be seen in this month’s ESPN The Magazine Body issue, where he was photographed with his teammates from the Indianapolis Colts. The Todd Herremans Foundation will receive proceeds from the sixth annual Rothamel Bratton LLC September Scramble golf tournament taking place September 18, 2015 in Marlton, NJ and the fourth annual Hoops for Help event will be held March 24, 2016 in Philadelphia. 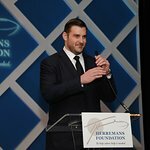 The Foundation, which provides resources for charitable organizations was created by Herremans to effect positive change in the communities of Philadelphia and surrounding areas, as well as his home state of Michigan.